'We Are Struggling': Cost Of Child Care Strains Many Families : Shots - Health News The most common challenge parents face when looking for child care is the high cost. At an average cost of $10,000 a year, infant child care rivals a year's tuition at a state college or university. "Cost continues to be an issue once parents find care, with many saying the cost is a problem for their families," says Gillian SteelFisher, research scientist and deputy director of the Harvard Opinion Research Program and the poll's academic leader. "This is especially true for those who feel their financial situation is not strong." Patricia Bauer, who lives in San Diego with her husband and two little boys, says cost is a constant challenge. Darcy, 3, and Merrick, 15 months, are in day care. Merrick is in a home care setting and Darcy in a more structured preschool. Bauer works in educational training, and her husband is a journalist. They've always considered themselves middle class, but today, barely. "We feel like we're working so hard, but any minute we could lose everything — you know, if we had some major emergency, we don't have savings," she says. And planning for the future? Bauer would love to. But right now there's just no way. Before children, both she and her husband contributed to their retirement funds at work. Today, that's just not possible. "We joke that as soon as our boys are in public school, we'll be rich!" In our poll, the vast majority of parents say there is a fee for their child care. Nearly one-third of those parents, like Bauer, say that cost creates a financial problem. And for 71 percent of them, it's a very or somewhat serious problem. Bauer actually considered quitting her job in order to save on day care costs. But, after crunching the numbers, she decided she just couldn't afford it because, without employer-provided health insurance, she would have to pay for health insurance herself. "That's another huge bill we couldn't afford," she says. Many families can't even consider a high-quality preschool. The poll found that 79 percent who said their household finances are not strong said they had "just a few" or "only one" option for child care. And parents with limited options were less likely than their counterparts with more options to say the quality of their child's care is "excellent" (56 percent vs. 66 percent). 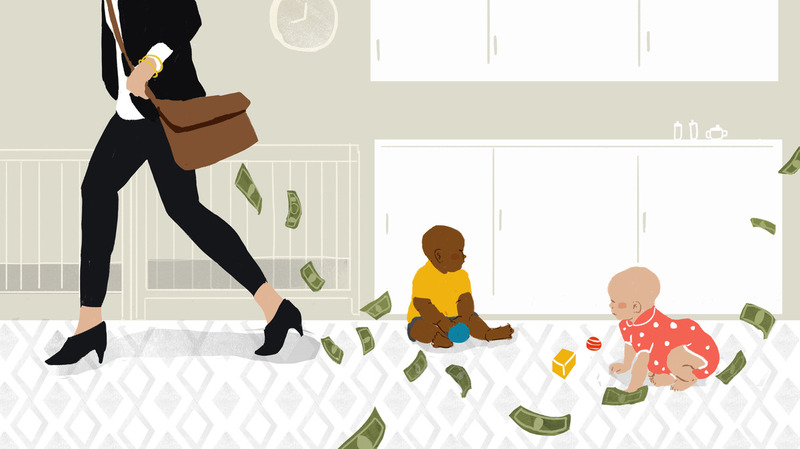 The median income for families in this country is just over $55,000 a year, and the average cost of infant child care is all but out of reach for them at $10,000 a year, says Rachel Schumacher, who directs the Office of Child Care for the federal Department of Health and Human Services. "That's a sizable chunk," she says. It rivals — and even tops — the cost of one year's college tuition at many state schools. One thing driving the high cost of child care is that it's so labor intensive, says Schumacher. While all states differ, most require a certain number of teachers or caregivers to ensure the health and safety of children. Now, you might think if the demand for child care is high, theories of competition would prevail and the supply would grow, resulting in greater competition. That, in turn, should result in lower prices. But this classic marketplace scenario just doesn't work when it comes to child care, Schumacher says. When parents don't have the money in hand to pay for high-quality care, they seek out lower quality, less expensive care options, she says, which may be unlicensed or "under the table." Therefore, she says, "it's just not going to work as your typical marketplace." Because the research has shown that 700 to 1,000 new neurological connections are forming every second in those first few years of life, she says, "the architecture built in the first few years is really rapid and very critical to everything that comes after." It's a strong argument for greater government investment in child care and early education, she says — especially when you consider that in today's world, so many parents, and even grandparents, work.